Erich Moritz von Hornbostel (25 February 1877 – 28 November 1935) was an Austrian ethnomusicologist and scholar of music. He is remembered for his pioneering work in the field of ethnomusicology, and for the Sachs–Hornbostel system of musical instrument classification which he co-authored with Curt Sachs. Hornbostel was born in Vienna into a musical family. The House of Hornbostel is a Saxon nobility. He studied the piano, harmony and counterpoint as a child, but his PhD at the University of Vienna was in chemistry. He moved to Berlin, where he fell under the influence of Carl Stumpf and worked with him on musical psychology and psychoacoustics. 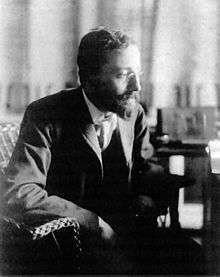 He was Stumpf's assistant at the Berlin Psychological Institute, and when the archives of the Institute were used as the basis for the Berliner Phonogramm-Archiv, he became its first director in 1905. It was during his time there that he worked with Curt Sachs to produce the Sachs–Hornbostel system of musical instrument classification (published 1914). In 1933, he was sacked from all his posts by the Nazi Party because his mother was a Jew. He moved first to Switzerland, then the United States, and finally to Cambridge in England, where he worked on an archive of non-European folk music recordings. He died there in 1935. Hornbostel did much work in the field of ethnomusicology, then usually referred to as comparative musicology. In 1906, he was in America to study the music and psychology of the Pawnee people, Native Americans in the state of Oklahoma; he had by that time already studied the native music of Tunisia and of South Sea Islanders. Hornbostel's students include American composer Henry Cowell. Hornbostel specializ in African and Asian music, making many recordings and developing a system that facilitated the transcription of non-Western music from record to paper. He saw the musical tunings used by various cultural groups as an essential element in determining the character of their music, and did much work in comparing different tunings. A lot of this work has been criticized since, but in its time, this was a rarely explored area. Hornbostel also argued that music should be a part of more general anthropological research. Hornbostel also contributed to the theory of binaural hearing, propose the theory of interaural time difference as the main cue, and developing sound localization devices (for finding the directions to artillery, aircraft, submarines, etc.) for the German war effort during World War I. With Max Wertheimer, he developed a directional listening device that they referred to as the Wertbostel. Erich M. v. Hornbostel and Curt Sachs: Systematik der Musikinstrumente. Ein Versuch. In: Zeitschrift für Ethnologie. Band 46, 1914, Heft 4–5, S. 553–590. Beobachtungen über ein- und zweiohriges Hören. In: Zeitschrift für Psychologie und ihre Grenzwissenschaften. Band 4, 1923, S. 64–114. ↑ James Mooney (1907). "Anthropological Miscellanea". American Anthropologist. American Anthropological Association. 9: 242. doi:10.1525/aa.1907.9.1.02a00240. ↑ Mitchell G. Ash (1998). Gestalt psychology in German culture, 1890-1967: holism and the quest for objectivity. Cambridge University Press. pp. 188–190, 236–238. ISBN 978-0-521-64627-7.